Segun Adeyemi, Abuja: The Minister of Information and Culture, Alhaji Lai Mohammed, has said the Federal Government will intensify and sustain the campaign for the patronage of Made-in-Nigeria products in its drive to diversify the economy, create employment and generate wealth. The Minister stated this in Lagos on Monday at the launch of the South West Campaign for the patronage of Made-in-Nigeria products by the Ministries of Information and Culture as well as Industry, Trade and Investment. “One issue that is very important to our Administration is the diversification of the economy away from oil. Boosting industrial development, especially through the local production of goods and services, is a major fulcrum of this policy. Patronising Made-in-Nigeria goods and services is also key to the success of the policy. This is why we are passionate about this Made-in Nigeria Campaign,” he said. Alhaji Mohammed restated the Administration’s commitment to institutionalizing the patronage of locally-made products by Ministries, Departments and Agencies (MDAs) through the review of the Bureau of Public Procurement Act to make it mandatory for the MDAs to patronize local products. He said the campaign followed the Executive Order signed by the then Acting President, Prof. Yemi Osinbajo, to encourage the patronage of locally-made products as a deliberate policy to conserve foreign exchange as well as to boost business for Nigerian companies so they can employ more people and earn revenue. 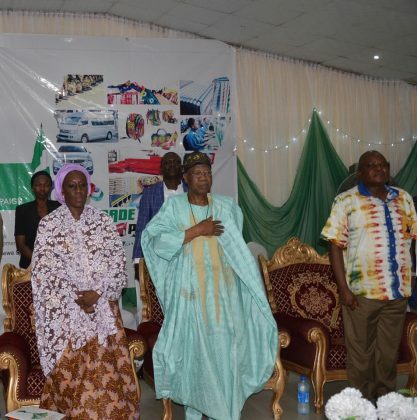 The Minister used the occasion to appeal to private media establishments to join hands with the government to create awareness among the citizenry on the patronage of locally-made products. He said he had personally undertaken a number of advocacy visits to encourage local manufacturers and also help to showcase their products, citing the visit to Innoson Motors in Nnewi, Anambra State, in June this year and his commissioning of a local manufacturing plant for Set-Top-Boxes in Calabar in October 2017. Alhaji Mohammed expressed the hope that manufacturers will key into the campaign and exchange views with other stakeholders, such as the Standard Organisation of Nigeria, to improve their products and enhance their packaging so they can compete with other products while also taking advantage of ICT to market their products. In her remarks, the Minister of State for Industry, Trade and Investment, Hajia Aisha Abubakar, said the vision of the present administration is to import that which is absolutely necessary for production purposes and export only finished, value-added products. She said in order to ensure effective implementation of the vision, a committee has been constituted to handle Monitoring, Evaluation and Reporting on the level of compliance by MDAs with the Executive Order 003 on the Ease of Doing Business and support for local content in Public Private Partnership by the Federal Government. Foremost Juju music maestro and an Ambassador of the ‘Change Begins With Me’ Campaign, King Sunny Ade, spiced the campaign with music.